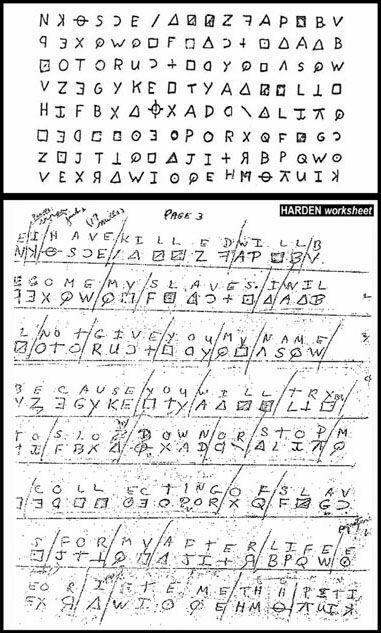 Zodiac Killer Ciphers – Page 10 – Can you help solve the codes? Michael Cole has a great recent post on his site concerning the flood of web traffic again generated by the interest in Corey Starliper’s debunked claim of a solution to the 340-character cipher. Michael’s indictment of shoddy journalism is spot on. If Corey Starliper walked into your office and announced that he had cured cancer, would you write the story: “Tewksbury Native: I’ve Cured Cancer” without seeking input from a medical professional? If he walked in and claimed to have solved one of math’s currently unsolved problems, would you write the article without doing something to evaluate the validity of his claim? I hope the answer to those questions is “No.” But, for some reason, if he walks in and says he’s solved a cipher that’s remained unsolved for the last 40 years, the Tewksbury Patch has no problem publishing an article without doing anything in terms of evaluating the probability that his solution is actually correct. His solution is garbage, pure and simple. Point me to one person with real cryptographic expertise who endorses Starliper’s solution. I’m going to go out on a limb and say that you cannot because I’m fairly certain one does not exist. Those of us who have definitively shown Corey’s solution to be incorrect are often criticized for being “jealous” of him for solving the code, or for not having a solution that is better than his. What those critics fail to understand is that I would be among the first people to celebrate a real solution to any of the unsolved Zodiac ciphers, no matter who comes up with it! To be rid of another long-standing mystery would be a great relief to us all. In the meantime, there is no reason to sit back and accept unsubstantiated claims without evaluating their merit. Reveal the mysterious secret of the still unsolved encrypted Zodiac letter. 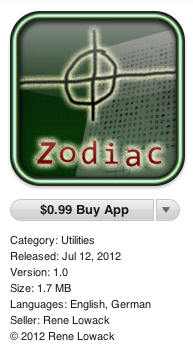 Zodiac was a serial killer active in California during the late 1960s and early 1970s. After killing, he wrote letters to local newspapers and demanded to publish them. Some of them contained also encrypted messages. 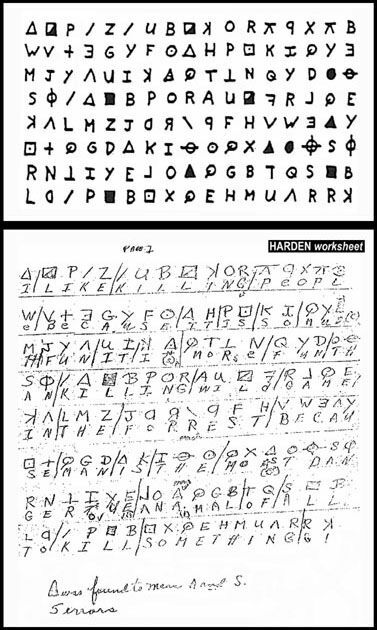 Only one of these cryptograms has been solved. The killer’s true identity is still unknown. It’s time to reveal his secret now. One way to attack a substitution cipher is to guess what part of the plain text solution might be, “plugging” it into where you think it might fit in the cipher text, and then seeing if you can get more of the solution to appear in the rest of the cipher text. Known as a “crib“, this type of attack can be useful if you get lucky and pick the right text. With skill and determination, Donald Harden and his wife got lucky. 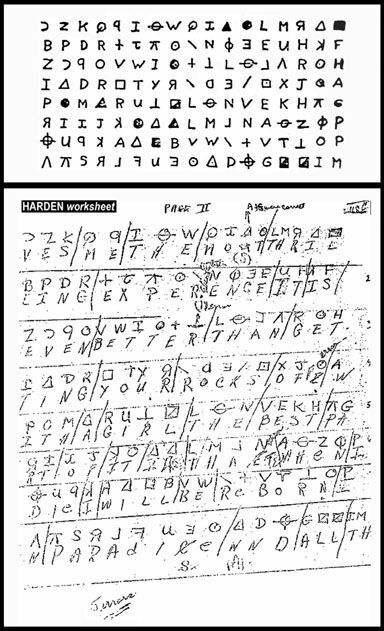 Their intuition that the killer used the words “I” and “killing” in the plaintext solution, combined with the fact that “L” is the most commonly doubled letter in English, led to their success in solving the first cryptogram sent by the Zodiac killer. 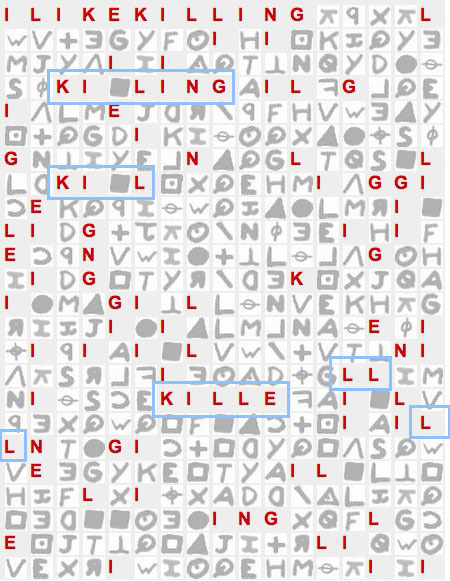 Even with only the small phrase “I LIKE KILLING” used as a crib, other easily solved pieces pop out of the puzzle. Retired Vallejo officer Lyndon Lafferty has been getting a lot of attention for his book in which he claims to know who the Zodiac killer was. The numerous criticisms of his claims aren’t mentioned by the various news stories, but you can find them here, here, here, here, here, and here. The detailed explanation and analysis, including the unbelieveable and undeniable pattern, will be offered for sale at the first opportunity. Over forty years of frustration have passed since the Zodiac killer first sent his mysterious 340-character cipher to the San Francisco Chronicle. It only took a week for two teachers to solve his previous cipher. But many thousands of people, over four decades, have tried to crack the mystery of the 340-character cipher, to no avail. You may have seen many would-be solutions in news stories and on the internet. The 408-character cipher was solved with a definitiveness that defies any possible doubt, because it is impossible for the Harden’s key (Part 1, Part 2, Part 3) to produce such an easily understood plain text message purely by chance. No such solution yet exists for the 340, despite numerous claims to the contrary. So, with so much failure and defeat confronting us, should we just accept the possibility that the killer, frustrated by the swift unlocking of his previous secret message, simply created a fake cipher to keep us all busy all these years? 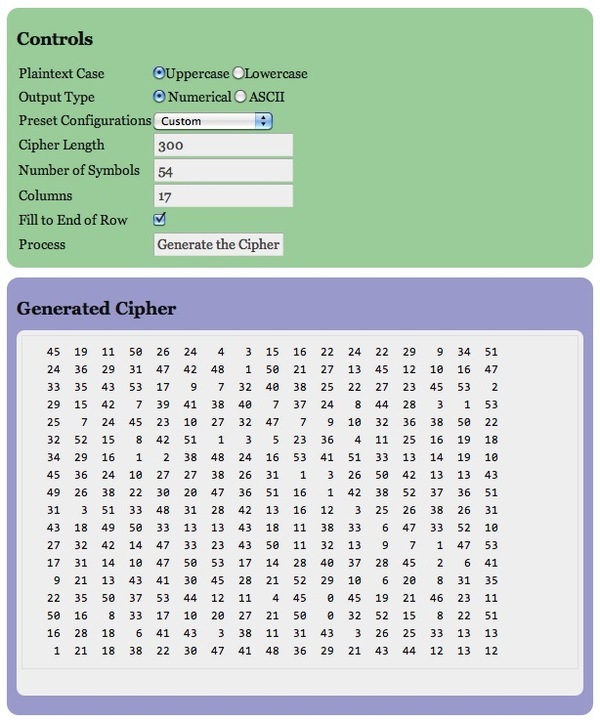 I think this tool is very useful for creating test ciphers that can be fed into cipher solving tools such as zkdecrypto, Zodiac Decoder, and CryptoCrack. Give it a whirl! 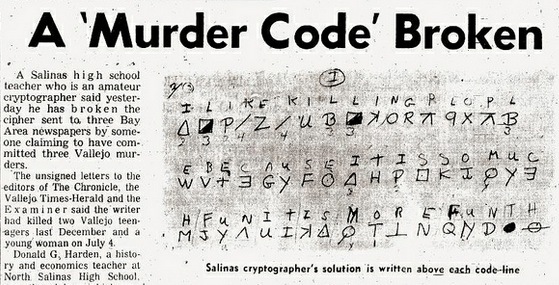 The killer’s first cipher was solved rather quickly by amateur codebreakers because they guessed that the killer would use words such as “I” and “kill”. Can similar guesswork help us solve the unsolved 340-character cipher? This is something people have been trying for years. But nobody has yet unlocked the mystery. Zodiac sent many letters over the years, taunting the public about his crimes. From this collection of plain text, we can see what words he really likes to use in his writings. Here are the results of an experiment that uses an algorithm to detect phrases and words that repeat in his writings. Perhaps somewhere among the results is something that might appear in the real solution of the 340-character cipher, if it indeed contains one. Let me know if anything appears to be missing! Also, contact me if you are interested in contributing content to the Wiki, a place to collect fact-based observations, experiments, and analysis of the Zodiac ciphers.